Kingdom Hearts 3 gets a 2018 release date and OH MY GOD IS THAT TOY STORY? 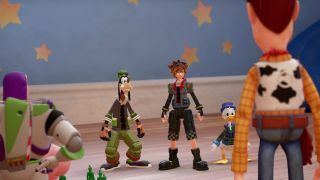 Kingdom Hearts 3 got a little love this weekend from Disney's D23 conference, including a release date, and new gameplay featuring the Toy Story gang joining the fight against the Heartless. It's all in there: Andy's room, his yard, the toy store (where you can see the claw aliens machine in the background). Nice touch controlling the mechs, too. No word on whether toy Sora will freeze around humans yet, although judging by all the fire works going off there it seems unlikely. There was a ton of other stuff revealed at D23 too, like new Star Wars: The Last Jedi footage, and a first look at the Avengers Infinity War trailer.